The arrival of suspended Jalandhar District and Sessions Judge R.M. Gupta has certainly added an element of charm to the otherwise-humdrum Burail Model Jail, which has become a major centre of attraction due to the presence of ‘VIP prisoners’ here. No to tuitions. This could well be the new mantra for all those who are in school and vying for the top positions in their examinations. Shopkeepers at the furniture market of Sector 34 here today downed shutters after the enforcement staff of the Municipal Corporation removed encroachment from the corridors in front of the shops. Don’t be surprised on seeing streetlights on during the day and off during the night on a number streetlight poles in the city. It is happening in the city courtesy thefts and snags in about 100 mechanical timers out of a total of around 300. A 75-year-old resident of SAS Nagar has developed a new century-wise multi-millennium calendar that is a reformed form of Julian and Gregorian calendars. Mr Inderjit Singh, who retired as an assistant engineer from the Public Works Department, has claimed to have removed all errors in both Julian and Gregorian calendars. BJP councillors Kamla Sharma and Rajesh Gupta here today demanded that the Municipal Corporation and the Chandigarh Administration should immediately halt the demolition of rooms in the backyards of houses in Sectors 21, 37 and 38. Two kids had a miraculous escape when a ceiling fan broke away from its mounting and narrowly missed them at the local railway station on Tuesday. One of the children suffered minor injuries as the fan’s blade brushed her cheek. Gurshabada Nand, brother of Dr D.S. Gupt, Education Correspondent of Danik Tribune, died today in Jalandhar. He was 55 and ailing for some time. He is survived by wife, a son and two daughters. With the arrest of four persons, the crime branch of the police today claimed to have succeeded in unearthing a major inter-state liquor smuggling racket operating from the city. At least 20,000 liquor pouches costing about Rs 2 lakh were seized from their possession. Two unidentified motor cycle-borne miscreants today beat up a Canada-based NRI, Mr Ranbir Singh Dhanjal and his wife and looted Rs 35,000, a bounced cheque for Rs 1.75 lakh and some documents relating to a cheating case while they were on their way back home in Sector 36-A from the district courts here, in the evening. The Chandigarh Administration has geared up to deal with any emergency situation arising from massive protests of the trade unions in the city tomorrow. It has imposed restrictions on taking out processions, making speeches, assembly of five or more persons, carrying of lathis in sectors falling in the north of Madhya Marg, from Sector 1 to 12 and Sector 26 in the city. Students of Government Model Senior Secondary School, Sector 35, are in a fix. Ordered by the school Principal and motivated by an inspiring pamphlet issued by the Shubh Karman Manav Sewa Society, SAS Nagar, the students braved scorching heat to collect money for the poor and needy, only to be later asked by the school authority to return the entire amount to the donors, thanks to the lack of co-ordination among officials of the Education Department, Chandigarh Administration. Panjab University is considering a move to streamline the fee structure in all affiliated private colleges of the university by making it uniform. There is a proposal to charge one fixed amount and do away with separate heads. Panjab University in a press note here today has denied reports in certain “local dailies” alleging unfairness in the evaluation of MA (English) papers. A student of Law Department of Panjab University was today arrested by the police for allegedly submitting fake graduation certificates to the university. The fake certificate was allegedly submitted to conceal the fact that the student had only passed Class XII before getting entry into the Law Department, the police said here today. It was fun all the way as new and old students of the National Institute of Technical Education got together and danced to peppy numbers at a freshers’ party, Thodi Masti Thodi Dhoom, at a local hotel in Sector 35 here today. Students of the National Institute of Technical Education perform at freshers’ party in a local hotel in Sector 35, Chandigarh, on Tuesday. YOU put pressure on something when you apply force to it. The amount of pressure depends on two things -- the size of the force, and more importantly, the size of the area on which force is applied. In a representation, over 700 advocates practising in the Punjab and Haryana High Court today urged the High Court Bar Association to call an emergency meeting of the general body for discussing “judicial affairs”, including methods to check corruption. Just a day before his pre-arrest bail application comes up for hearing in a local court, suspended UT Judicial Magistrate (First Class) S.S Bhardwaj, in an interview given to news channel ‘Aaj Tak’, claimed that he was falsely implicated in the case and that he was not absconding. The Yaadgar-e-Rafi Society will hold the first round of singing competition for Rafi Award-2003 in senior category (men and women) on June 15 in the mini auditorium of DAV College, Sector 10. The long wait for doctors in the newly constructed General Hospital here is finally over. The state government today ordered the transfer of nine medical officers from different parts of the district and neighbouring district of Ambala to General Hospital here. Chandigarh team that had scored 268 runs in its first innings restricted Mohali team to 194 runs in its first innings on the second day of the three-day Punjab Inter-district Under-19 Cricket Tournament at the PCA Stadium, SAS Nagar, today. Later, Chandigarh, in their second innings, had scored 15 for no loss after facing four overs. Succumbing to the pressure of Asian badminton superpowers, whose players had earlier advocated for switching back to the old scoring format, finally the International Badminton Federation has okayed the proposal. 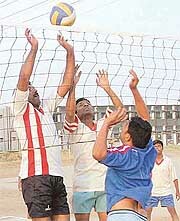 The Chandigarh area defeated the Srinagar area 25-12, 25-8 in the ongoing Western Air Command Inter-Area Volleyball Championship at the 12 Wing, Air Force Station, here today. Former Indian cricketer and commentator Navjot Singh Sidhu will deliver term-deposit receipts to customers of the local branch of the State Bank of India here on Monday. The township will have a new Estate Officer soon. Mr T.K. Goel currently serving as the Estate Officer here has been ordered to be transferred to Dhuri as the Sub-Divisional Magistrate, barely after he had completed 11 months in the office. The Deputy Commissioner, Ms Satwanti Ahlawat, today appointed nine Executive Magistrates as Duty Magistrates in various parts of the district following a strike call given by the Sarvkaramchari Sangh and other allied employees’ associations.